Traces of the Factory: H.P. Cannon and Son, Inc.
H.P. 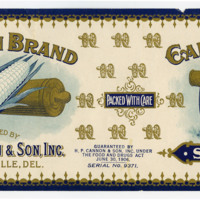 Cannon and Son, Inc., which produced canned goods between 1881 and 1981, was one of the largest canning companies established in Delaware. Gradually moving from canning fruit to exclusively vegetables, the company experienced significant growth during their existence. At one point near the end of World War I, they were a leading producer of sweet peppers. With such an impact on the canning industry in Delaware, it is interesting that the Cannon name has drifted into the shadows of Delaware’s collective memory. It is difficult to find any extant examples of Cannon’s canned goods and many of the materials associated with the name are tucked away in archival collections. One trace of the company can be seen in Bridgeville, Sussex County today: the old Cannon Cannery factory. Although the building is repurposed for another company, it still provides us a glimpse into the past when Delaware’s industrial heritage really began. The large factory also captures a moment in the company’s success, where large-scale production reached its height during the 1950s. Looking at archival materials and photographic collections recounts the Cannon Company’s history and its impact on the Delaware agricultural industry. This will shed light on the factory’s workers who were integral to the success of the cannery, particularly, the lives of the African-American itinerant workers at the factory. The Brandywine Creek winds through southeastern Pennsylvania and northern Delaware. Today it is crossed by bridges and abutted by state parks. In the summer people float down it on inner tubes; it is a part of the natural landscape. Two hundred years ago, however, the Brandywine was viewed as a source of power and a site of industry. In the fourteen and half miles of creek between Chadds Ford, Pennsylvania and Wilmington, Delaware, where it drains into the Delaware River, the Brandywine drops 160 feet. This change in elevation meant the Brandywine was the perfect site for establishing water powered mills in early Delaware. By the early nineteenth-century, the river was churning with industry. 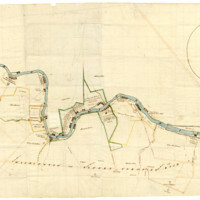 This is evident on an 1816 map of the region, which resides today in the collection of the Hagley Museum and Library, a repository for America's early industrial history. The water of the Brandywine propelled the creation of paper, textiles, gunpowder, flour, and more. Many of its mill seats were also sites of innovation, where new technologies were implemented, or even invented. The individuals who ran businesses on the banks of the creek were often involved in multiple industries, demonstrating their entrepreneurial spirit. One such man was William Young, who produced both paper and textiles at Rockland Mills between 1795 and his death in 1829.